← How The Last Jedi Fixes Star Wars; Yes, I Said It. And here it is! The final rejected question from xkcd writer Randall Munroe’s book, What If? It’s been a crazy ride. 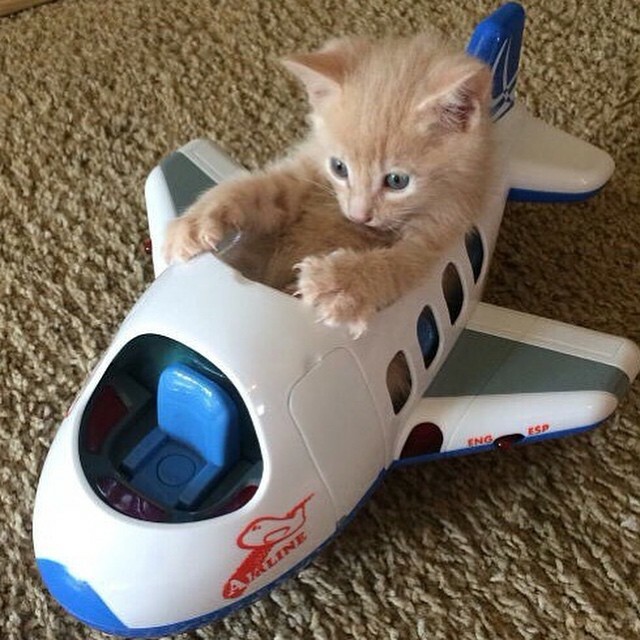 Q: Assuming a relatively uniform resonant frequency in a passenger jet, how many cats, meowing at what resonant frequency of said jet, would be required to “bring it down”? My response: I’m not sure why “bring it down” is in quotation marks. The wording of this problem asks us to make two pretty big assumptions: that a passenger jet will have a uniform resonant frequency, and that it will vibrate freely enough that bombarding it with sound waves will damage it. At first, these seem like questionable assumptions. Shouldn’t airplanes be designed better than that? But no, it’s actually not crazy. Flutter is just such an oscillation, usually a bending of an airplane’s wings and fuselage that can occur when it is buffeted by turbulence and which can destroy a plane in extreme cases. Engineers will mitigate it, but it’s simply not possible to design wings to fully resist those forces. In fact, this has happened before multiple times. Braniff Flight 542 in 1959 and Northwest Orient Flight 710 in 1960 both broke up in midair due to turbulence-induced flutter causing their wings to snap off, despite both being a then-new type of plane designed to eliminate flutter. In airplanes, resonant frequencies can be deadly. So the premise is—disturbingly—plausible. Now, how does it relate to cats? This NASA study examined the resonant frequencies of aircraft wings and found a range of frequencies between 2 Hz and 50 Hz. That is not the frequency of meowing cats. These are deep bass notes at best. The lowest bass note in the standard opera repertoire is a low D at 73 Hz. Only the most extreme Russian composers pushed down to the G below low C at 49 Hz. This “plot” isn’t going to work with cats meowing. It’s going to need cats purring. Domestic cats purr at different frequencies, but they average around 22 Hz, right in the middle of the resonant frequencies of airplane—a sound that’s more felt than heard by human ears. And this is a problem because while cats can meow at a potentially worrying 93 decibels, the loudest recorded purr is only 67.8 decibels, not much louder than your television. 70 decibels is a sound power level of only 0.00001 watts per cat, which is just not enough to do any serious damage to a plane, no matter how many you have. And that’s if you can get them all to purr at the same frequency, and that would be like, well, herding cats. The bottom line is, you’re only going to bring down a passenger jet with cats if you load so many on that you put it over its weight limit. How many is that, you ask? Well, the Airbus A320, the most popular passenger jet in the world, has a maximum cargo capacity of 44,100 pounds. Given the average weight of a house cat of 9 pounds, that’s 4,900 cats. And now you’re back to the herding cats problem. That’s probably for the best. This entry was posted in What If? Rejects and tagged airplanes, cats, resonant frequency. Bookmark the permalink. This is the last one? I’m saddened by this. You must find a substitute series. Meanwhile, this is one of my favorites. Who knew purring cats could be so ominous?Question… What if we substituted larger cats for housecats? What decibel do tigers purr at? Or jaguars? Or leopards? Lions? Could any collective of large cat breeds do the job? Also, can someone make a movie of this? “Pumas on a Plane!”, starring Lawrence Fishburne as the recently-retired cop looking for a much-deserved vacation, Jeff Goldblum as the expert zoologist responsible for transporting twelve large-breed cats across country for a ludicrous reason having something to do with a zoological convention & a shocking lack of funding for the usual animal cargo planes (the cats, btw, were all supposed to sleep through the flight, but Goldblum’s young assistant screwed up the anesthetic dosage), and Rita Rudner as the embittered stewardess who has been combatting her depression brought on by a shocking, sudden divorce by sleeping with dozens of younger men but who can only find true solace in her pair of Persian housecats, both of which travel with her on every flight, and one of which gets eaten by a hungry, enraged cougar (notice the ironic cultural pun, lol) in the first Act.